Datanamic MultiRun is a simple tool to quickly execute multiple SQL scripts against multiple databases. The tool supports multiple database platforms. MySQL, Oracle, PostgreSQL and MS SQL are supported. This tool is a real time saver. No more annoying repetitive script execution tasks. Datanamic MultiRun is an ideal tool for database professionals who need to deploy a bunch of SQL scripts to multiple servers. Execute scripts on MySQL, Oracle, PostgreSQL and MS SQL Server databases. Configure a list of SQL scripts and run the scripts against a list of databases. Datanamic MultiRun provides a multi-threaded environment for fast execution of the SQL commands. You can execute the same SQL script on databases with a different version number. Your list of databases may contain for example contain MySQL 4 and a MySQL 5 database. Database messages and other command execution output will automatically be saved to text files in a user defined directory. Simple user interface: Only four tabs (list of databases, list of scripts, execution settings and the results browser) and one button, Execute. You have got full control over what must happen when an error occurs while executing the scripts. You have got four options: Stop executing, Continue executing, Stop executing script on database with error, Stop executing statements after statement with error on database with error, Stop executing any script on database with error. Save the list of databases, the list of SQL scripts, execution settings and execution results. Execution order of SQL scripts can be changed manually by moving them up and down in the list of scripts. You can easy navigate through the execution results with the results browser. 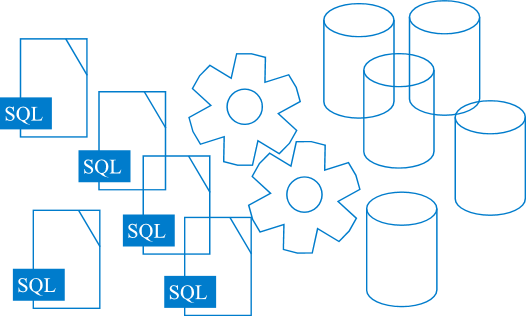 Detailed information is available for every database against which a SQL script is executed. You have got the option to add the script execution output to a single file. Datanamic MultiRun can load and display large SQL scripts without problems. Handling of unicode scripts is supported. Datanamic MultiRun displays unicode SQL scripts and executes unicode SQL scripts. A progress indicator for each database is displayed during the execution of the scripts. A command-line utility is included. You can create a project with the GUI application and (if desired) execute this project with the command-line utility. This way you can further automate your script deployment. Oracle, MS SQL Server, MySQL, PostgreSQL. Pricing for Datanamic MultiRun starts at $ 99 for a single user license (EULA). Download a free trial, and start deploying SQL scripts today.